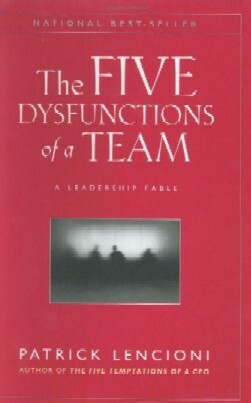 Just finished reading Lencioni’s the other book The Five Dysfunctions of a Team 團隊的五種機能障礙. Although it is not a sequel to his previous books, it is termed the third in the trilogy which includes The Five Temptations of a CEO and the Obsessions of an Extraordinary Executive. The thoughts are continuous. One could spot the consistency in Lencioni’s theories and also his style in presenting them in fables. Reading through the story, managers could project themselves in the position of the characters, and experience the familiar scene in their own office. The story is about how a newly appointed CEO tried to re-establish the dysfunctional management team of the company, the ways that teamwork could elude even the most dedicated individuals, and how could it be restored. In a series of off-site management meetings, the CEO asked the team to examine their interpersonal behaviours and to create healthy conflict and accountability among the group. She tried hard to prevent members from sliding back into old habits, and lost a couple executives in the process. 1. The first dysfunction is an absence of trust among team members. Essentially, this stems from their unwillingness to be vulnerable within the group. Team members who are not genuinely open with one another about their mistakes and weaknesses make it impossible to build a foundation for trust. 2. This failure to build trust is damaging because it sets the tone for the second dysfunction: fear of conflict. Teams that lack trust are incapable of engaging in unfiltered and passionate debate of ideas. Instead they resort to veiled discussions and guarded comments. 3. A lack of healthy conflict is a problem because it ensures the third dysfunction of a team: lack of commitment. Without having aired their opinions in the course of passionate and open debate, team member rarely, if ever, buy in and commit to decisions, though they may feign agreement during meetings. 4. Because of this lack of real commitment and buy-in, team members develop an avoidance of accountability, the fourth dysfunction. Without committing to a clear plan of action, even the most focused and driven people often hesitate to call their peers on actions and behaviors that seem counterproductive to the good of the team. 5. Failure to hold one another accountable creates an environment where the fifth dysfunction can thrive. Inattention to results occurs when team members put their individual needs (such as ego, career development, or recognition) or even the needs of their divisions above the collective goals of the team. Members of a truly cohesive teams trust one another, engage in unfiltered conflict around ideas, commit to decisions and plans of actions, hold one another accountable for delivering against those plans and focus on the achievement of collective results. Trust is the first dysfunction presented in the story. Great teams require members to make themselves vulnerable to one another and be able to expect that their vulnerabilities will not be used against them. It is only when members of a team are comfortable having their colleagues know their weak points that they will be able to work together making their greatest concern the job at hand, not protecting themselves. The second dysfunction presented is inattention to results, which is the tendency of team members seeking out individual recognition and attention at the expense of the team’s collective results. It is like a coach speaking individually to members of a football team during half-time, without them knowing what everyone else was talking about, indicating that such behavior would represent a collection of individuals, not a team. The third dysfunction identified and explained is the fear of conflict. Meetings are the most important setting for conflict. Meetings are boring because we have adopted a practice of avoiding conflict in meetings and not engaging in dialog to help expand commitment to goals and our understanding of what needs to be done. The fourth dysfunction in the story is lack of commitment, which is prone to occur when a team has not openly and passionately explored all the options. Team member rarely buy in and commit to decisions even though they may feign agreement during a conflict-less meeting. The final dysfunction discussed in the story is avoidance of accountability. Since the team has not truly engaged in an open dialog and has not truly committed to an action plan, it is difficult for peers to call one another on actions. 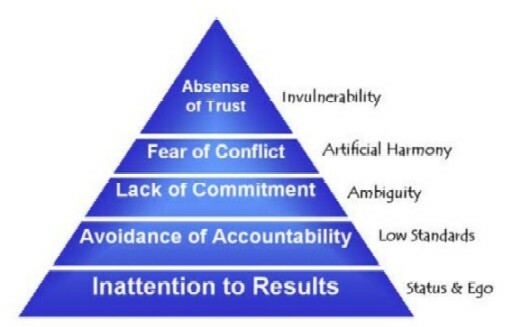 Lencioni aptly summarized the consequential impact of the dysfunctions of a team starting from the absence of trust. Because we need to appear invulnerable, we create an absence of trust. Because we fear conflict, we have artificial harmony on our team. Because we lack commitment, we encourage ambiguity. Because we avoid accountability, we ensure low standards. Because we seek personal status and ego we are inattentive to results of the team. "If I remember correctly, about 15 years ago when the West Kowloon development plan was first issued, the zoning was in a better shape than the groups of skyscrappers we see nowadays. There was more space for leizure, although in those days it was not earmarked for cultural activities. There were the West Kowloon Government Offices Building, probably to replace the one in Nathan Road, and other government faciities as well. I cannot find such facilities within the clusters of high rise buildings. With the buildings and population growing so fast and without additional faciities like police station, fire station, ambulance depot, clinic or increase capacility of the hospital in the district (QEH ? ), etc., I doubt if the existing ones can absorb the additional work. Everyone is focussing on the cultural development site. This includes our Principal Officers and the HoDs of the Works Departments. Even the District Councils and LegCo members raised nothing on all these other essential services to be provided by the Government. This is the standard of our so called "politicians". Is this what we deserve ? Was the past colonial rule better ? Are we, or the current CHT regime of such standard that we cannot even uphold what was left behind by the previous government, not to say anything like "sustainable development" ?" It is quite right that the original plan for the West Kowloon reclamation was general land use for commercial/residential use, GIC facilities and open areas for leisure. During 1997 to 1999, CE included in the policy addresses that a major performance venue will be included in the area. But in 2000, things took a sharp turn and Hong Kong dreamed of a world class cultural district there. A worldwide competition on the conceptual design was launched in 2001, attracting 167 entries. The winning design by Norman Foster with the famous canopy received international praise in 2002.
and A canopy covering at least 55% of the development area. Really world class. The question is how to pay for it and how can it be run effectively. The short answer is: don't let the government do it. For more information on the background and details of the project, we can ask Paul who is the keeper of the WKCD website in the bureau. There are immense interest everywhere on the project. I have an article on WKCD in my weblog. The weblog was hit in the last few months by many search engines on this topic, with many searches initiated from overseas. The most popular searched words were West Kowloon Cultural District, Sunny Development and Dynamic Star. You don't need to worry about amenities. The development plan will go through TPB and everything will not be missed. I am sure that conditions on GIC facilities will be included in the land lease, probably the developer will be required to pay for it. The idea of launching WKCD as a PPP project is good. The private sector involvement could ensure that the whole business is sustainable. There is a good chance that the revenue in running business of all venues, rental, restaurants, shops, etc. could meet the recurrent maintenance cost. The capital cost could be amortized and met by sale of residential flats. I think the big mistake that the government made is the relaxation of the plot ratio. For the present day environmentally-minded population, such an exception is hard to accept, thus creating the public outcry that the property developers can get a bigger than normal profit than they deserve. If government does not want to inject additional fund, then the cost of the infrastructure must balance the revenue generated from the portion of land used for property development under normal circumstances. However, the government has let the developers design with the sky as the limit, and the developers promptly raise the plot ratio to the sky to make ends meet plus a handsome profit. The government is now in a dilemma that it is hard to ask the developers to reduce the plot ratio without reducing the scope of the cultural facilities. The future of the project is not optimistic.